Brazil has occupied a central role in the access to medicines movement, especially with respect to drugs used to treat those with the human immunodeficiency virus (HIV) that causes the acquired immune deficiency syndrome (AIDS). How and why Brazil succeeded in overcoming powerful political and economic interests, both at home and abroad, to roll-out and sustain treatment represents an intellectual puzzle. 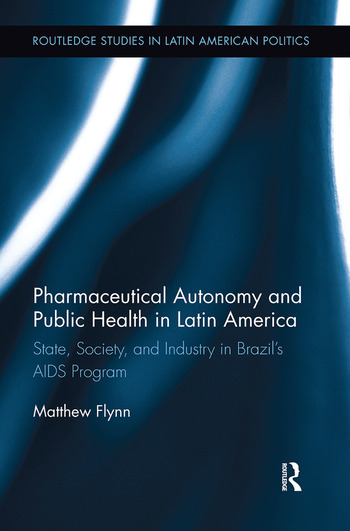 Pharmaceutical Autonomy and Public Health in Latin America is one of the only books to provide an in-depth account of the challenges that a developing country, like Brazil, faces to fulfill public health objectives amidst increasing global economic integration and new international trade agreements. Scholars interested in public health issues, HIV/AIDS, and human rights, but also to social scientists interested in Latin America and international political economy will find this an original and thought provoking read. Matthew B. Flynn is an Assistant Professor of Sociology and International Studies at Georgia Southern University in Statesboro, Georgia. His research focuses on the political economy of pharmaceuticals in contemporary society.